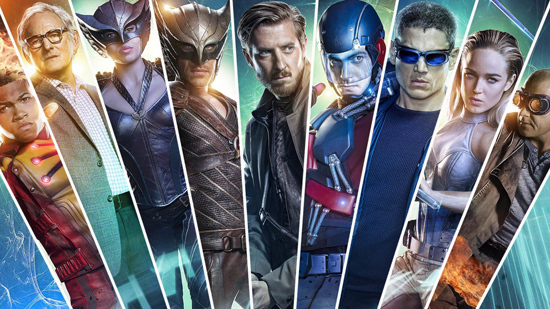 I've seen up to the fourth episode of The CW's new superhero adventure series Legends of Tomorrow, and while it's been quite entertaining and contained one big surprise in episode 3 that I didn't see coming (although it can probably be unwritten because this is a comic-book show), the entire concept fills me with concerns and questions. So, what better place to air them than here? It's difficult to write for large ensembles, but even tougher to write for teams. Most shows with multiple characters focus down on a handful of them every week (see: Mad Men), or their concept allows for an ensemble to have varying prominence every episode (see: Star Trek). Or the team is simply quite a manageable size, of three or four people (see: uh, The A-Team). At its start, LoT has eight leads (nine if you count self-appointed leader, the time-traveller Rip Hunter), and they're all focused on one thing: stop villainous immortal Vandal Savage from ruling the future Earth. It's unlikely we'll get episodes where half the gang just sit an adventure out and go for coffee, because it just wouldn't make sense! But if every episode is going to have to deploy nine characters into a story, all committed to the same goal, that's a lot of headaches trying to give them all something meaningful to do. The problem hasn't arrived yet because we're still in the 'honeymoon period', where everyone's getting to know each other and their shared situation is very fresh. But by mid-season, I'm curious to see how the writers plan to stop every episode becoming a hectic mess of characters running around. The Legends are a formidable force already, even if they're a bit scrappy about how they go about things. Firestorm can fly, inhale nuclear blasts, and shoot fire from his fingers. The Atom can also fly, shoot energy blasts from his hands, and shrink to tiny proportions. Hawkgirl and Hawkman can fly and bore people to deal with talk about fate and destiny. White Canary can win most hand-to-hand combat situations. Captain Cold and Heat Wave have those nifty freeze/heat guns to shoot around when things get tight. Rip Hunter is a genius with future knowledge and a flying time-machine. Consequently, it'll be tough to give them enemies who present a big challenge—especially if, this being a time-travel show, many episodes will presumably take place in the past (pre-The Flash, so there aren't many meta-humans around). I'm sure there can be exceptions (Savage and episode 2's cameo for Damian Dhark proves that), but if the Legends are mostly going to be fighting normal folk in the past... the odds are seriously stacked in their favour! Most missions into history should be a cinch, and I hope the writers don't make it feel ridiculous they keep running into trouble. I was already a bit drained that most action scenes in LoT involve the gang flying and shooting and punching with an incredible amount of firepower against... well, ordinary men with guns and flared trousers. It's always a problem, isn't it. Even the good time-travel shows don't always make sense, logically speaking. LoT has already laid down a few welcome ground rules (changes to the future take awhile to become permanent, there are certain things that are fixed events, you can't undo things in the past that you've directly been involved with), and they're sensible restrictions. However, I'm curious about the concept of LoT being this super-team tracking down Vandal Savage and how that will play out. The first two episodes took place in 1975, where Savage has now become aware of the 'Legends' and what their skills and abilities are. If they meet him again post-'75, he'll remember them. But if they meet him again anytime before '75, he won't... but then, if they do eventually meet him further back in time... why didn't he recognise them originally in 1975? Logically, we can never have a Savage-related episode that takes place pre-'75 now. Yeah? I just wonder how far the writers are going to be take the logic of time-travel. It would only really be less of a problem if Savage also had a time-machine, so they could play chase through Time & Space.